Be thankful most of the key injuries were on the offensive side of the ball this week. 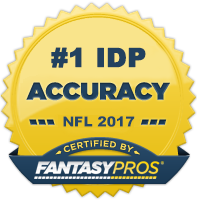 IDP’ers got through relatively unscathed. Left the game with a shoulder stinger. Considered day-to-day. The biggest star going down on Sunday, he tore his Achilles and is done for the year. Played with a cast on his wrist and admitted it bothered him and affected his play. Will continue to play barring setbacks or re-aggravation. Torn ACL. Done for the year. Suffered a concussion in Monday night’s game. Very questionable for this week. Separated shoulder in Sunday’s game. Did not return and is questionable for this week’s game. DRC said he tore ligaments in his ankle Sunday. Supposedly questionable, but I don’t know how he’ll play if it’s true. Chancellor suffered a concussion Sunday but responded well to his Post-Concussion tests on Monday. Probable for this week. Thanks for reading! Comments, suggestions or questions are welcome below or by email at ericolinger@idpguru.com. You can also follow my active Twitter feed @Olinger3781.